Fallen Fruit of San Bernardino! Made possible through grant funding from the California Arts Council, The City of San Bernardino Fine Arts Commission, and SoCalGas. 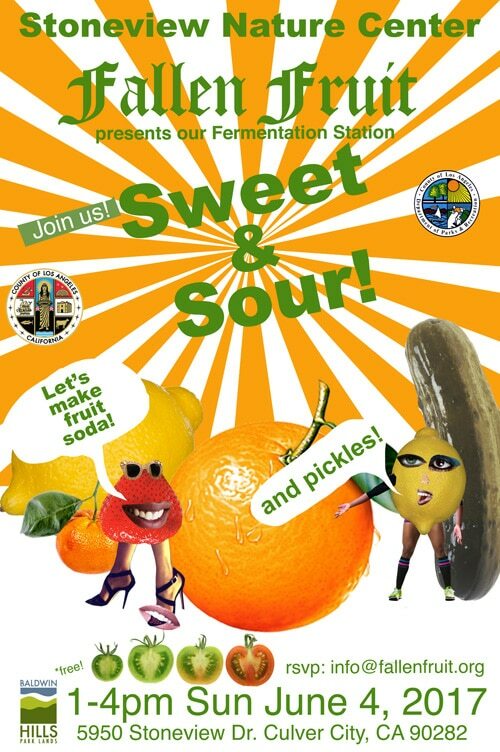 “Fallen Fruit San Bernardino!” will include a series of events in different regions of the county. Our first public participatory event will be at the San Bernardino County Museum on March 10th. Celebrate the “Festival of Life in the Cracks” day by adopting a fruit tree, drawing a self portrait on an orange, or taking part in our collective zine project! 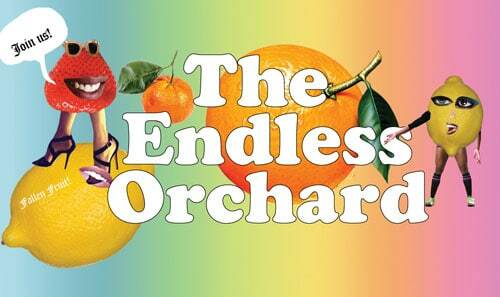 The Endless Orchard is coming to San Bernardino! Collaborate with us by adopting a fruit tree to share with neighbors! • You have a home, business, or community center in San Bernardino. Preference will be given to our neighbors in the Inland Empire basin. • The tree will be accessible to neighbors and passersby – placed in the front of your yard right next to the sidewalk. • You agree to water and care for the tree for the first three years. • You’re willing to share the bounty! Your tree will be part of the Endless Orchard map, which shares the locations of public fruit trees throughout the city. Contact David and Austin at info @ fallenfruit.org with any questions or to learn more. Fallen Fruit was originally conceived by David Burns, Matias Viegener and Austin Young. Since 2013, David and Austin have continued the collaborative work. fruit tree care, master pruning, micronutrients, planting in public spaces. This is a one-day course that is 100% free (no charge) to the public. We are limited to 15 spaces and applications are accepted through February 16th, 2018. It is a brief application process and we are looking for active and engaged community leaders who are participating in community engagement and transforming neighborhoods in Los Angeles County. Each participant will get hands on training on master tree care and receive 3 fruit trees to plant in your neighborhoods public spaces. Let’s hangout and knowledge share! Fallen Fruit of New Orleans- Community Fruit Tree Plantings! Pelican Bomb, A Studio in the Woods, and Newcomb Art Museum of Tulane University present “Fallen Fruit of New Orleans,” a citywide suite of public projects with internationally acclaimed artists Fallen Fruit (David Burns and Austin Young). This multi-site presentation continues Fallen Fruit’s exploration of the ways people experience public space. As one component, Fallen Fruit will plant 300 fruit trees throughout New Orleans in 2018—in honor of the city’s tricentennial. Individuals and community groups are able to adopt fruit trees, free of charge. In the spirit of sharing resources, trees must be planted to overhang a public sidewalk or street so that the fruit is accessible to passersby to pick. On January 13, the planting initiative kicks off with a community day in the Lower 9th Ward. Together with neighborhood residents and volunteers from throughout the city, Fallen Fruit are planting 30 trees along the Bayou Bienvenue Wetland Triangle, inaugurating our first public fruit park in New Orleans. Through a partnership with the Lower 9th Ward Center for Sustainable Engagement and Development (L9CSED), the park will be maintained and available for residents year round. With community outreach support from L9CSED and Movin’ for Life, over 40 residents and community groups have pre-reserved trees and these can be picked up 10 am–12 pm. Any remaining trees will be available on a first come, first served basis to residents of the Lower 9th Ward and may be adopted 12–2 pm at L9CSED’s Environmental Learning and Research Center on the corner of Florida and Caffin Avenues. Volunteers from the citywide New Orleans Martin Luther King Holiday Planning Commission will be on hand to assist with the transport and planting of fruit trees. On January 20, we’re launching our second public fruit park, in Pontchartrain Park, featuring 50 fruit trees, planted and maintained in partnership with the City of New Orleans Department of Parks and Parkways. Gentilly residents and community groups are also able to adopt individual fruit trees: 10 am to 12 pm for those who have already reserved a tree and 12–2 pm for those who have not reserved a tree in advance, subject to availability. The adoptions will take place at the Joseph Bartholomew Clubhouse in Pontchartrain Park. Student volunteers from Tulane University and Loyola University, as part of the Martin Luther King, Jr. Day of Service, will be available to assist with the transport and planting of fruit trees. And on January 23, 4–6 pm, all interested New Orleans residents citywide can adopt a tree at Newcomb Art Museum of Tulane University. Trees will be adopted on a first come, first served basis, and we cannot guarantee availability. Priority will be given to those who have pre-registered. This event also introduces Fallen Fruit’s upcoming exhibition “EMPIRE,” which opens April 12 at Newcomb Art Museum. If you’re interested in volunteering or if you’re a community member interested in “Fallen Fruit of New Orleans,” contact katrina@pelicanbomb.com. Fallen Fruit started in 2004 in Los Angeles with the creative mapping of locations of fruit growing on or over public property, and since then the artists have worked in over 30 cities around the world. The planted fruit trees in New Orleans will join Fallen Fruit’s Endless Orchard, a massive, living public art and digital mapping project. Fallen Fruit is an art collaboration originally conceived by David Burns, Matias Viegener, and Austin Young. Since 2013, Burns and Young have continued the collaborative work. “Fallen Fruit of New Orleans” was initiated by Pelican Bomb in 2015. Contact Charlie Tatum at charlie@pelicanbomb.com with all press inquiries. 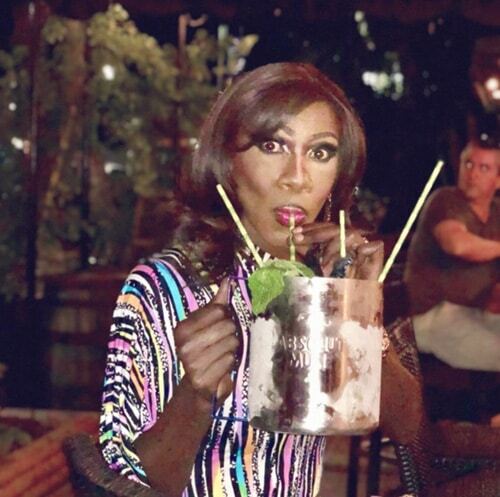 FALLEN FRUIT performs FRUIT COCKTAILS to celebrate the opening of Beth Rudin DeWoody’s private art space, ‘The Bunker’ in West Palm Beach, Saturday, December 2, 2017. The new Wallpaper Pattern for West Palm Beach commissioned by Beth Rudin DeWoody for her new private art space, The Bunker. FRUIT COCKTAILS is a project by Fallen Fruit, David Burns and Austin Young, in which we select fruit we discover in a neighborhood, or on a certain block or street, infuse it in vodka or tequila,. What FRUIT COCKTAILS ask to participants is tinged with a bit of irony: can you capture the essence of a place in a bottle? Regardless of the answer, we hope that by capturing the character of this neighborhood’s best qualities we remind everyone that celebrating the local and and the values of protecting the environment around us. The bottles of fruit infused FRUIT COCKTAILS may be presented in gallery exhibitions, museums and at special events. They are considered a work of art that happens to be consumable. The Artists of Fallen Fruit will not serve them, nor will a bartender. They are to be served by a specially outfitted “tour guides” and while the artists will make efforts to be at all presentations, the tour guides may serve them without us. Just as in a gallery tour, the they will discuss the work, about the experiences of place and be charged with answering questions about it. Our recent infusions have been West Palm Beach Coconut Vodka and Mango Sunset Tequila. Ariel Rimm-Chanel, Rianna Petrone, Kataleya Davenport Dupree and Melissa St. John. Cocktails are prepared on trays in disposable colored cocktail glasses. For each cocktail 1.5 ounces of tequila or vodka poured over ice 50/50 with unflavored carbonated water (not club soda). Trays of cocktails are offered to guests by tour guides. Tour guides are more like seasonal hosts at a resort. 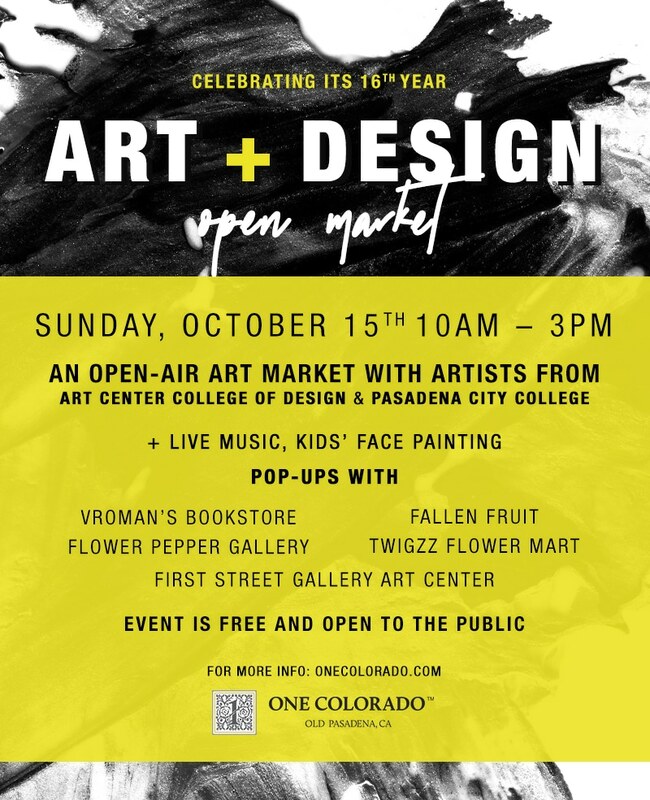 One Colorado and the artist collaborative Fallen Fruit invite you to adopt a citrus tree to be planted in a public space. These trees will serve to foster new kinds of community based on generosity and sharing. For this event, you will become a collaborator, taking care of the tree to share with neighbors (planting next to sidewalks in FRONT of homes, business, community centers). When you pick up your tree you’ll sign adoption papers making your commitment to kindness official. Your tree will be mapped to share on the Endless Orchard. We are looking for participants who would like to plant and care for fruit trees in the neighborhood. Each tree will be planted next to sidewalks or hang over public space, offering free fruit to the community. Plus, we’re producing a map to help you find all the public fruit trees. Adopt a tree: If you have a home, business, or community center, you can plant an orange, lemon, pomegranate, or other type of fruit tree near the edge of your property. Assistance with planting may be provided. Care for the trees: The first two years after planting are critical for watering and pruning. We need your help to make that happen. Enjoy the bounty: Fruit produced at these sites will be available to everyone! Questions? Email Fallen Fruit at info@fallenfruit.com. Cmon! Visit our online store! 30% off EVERYTHING for the next 30 days. The more you shop the more you give. 30% off EVERYTHING for the next 30 days. use CODE: FRUIT at checkout. Every dollar you spend goes toward Fallen Fruit’s tree care, our operations budget, planting fruit trees in public space for EVERYONE to share, and creating easy access to publicly available fresh fruit. SO THANK YOU! Thank you for sharing your fruit. Fallen Fruit is a project of Fulcrum Arts’ Emerge fiscal sponsorship program. More info HERE. Pelican Bomb,The Lower 9th Ward Center for Sustainable Engagement, A Studio in the Woods, Newcomb Art Museum of Tulane University and the City of New Orleans Parks and Parkways are partnering to bring artists Fallen Fruit to plant a networks of publicly accessible fruit trees along the Bayou Bienvenue Wetland Triangle in the Lower 9th Ward. 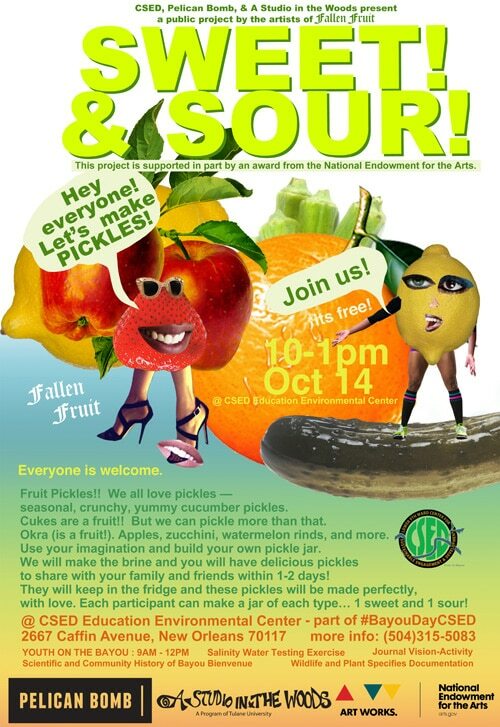 a public project by the artists of Fallen Fruit: Pickle Party! *The Bayou Bienvenue Triangle in the Lower 9th Ward is the site of one of our future Public Fruit Parks, part of ‘Fallen Fruit of New Orleans.’ This project is supported in part by an award from the National Endowment for the Arts. Hey everyone! Let’s make a zine – about Baldwin Hill’s families, friends, and history! A 3 hour collaboration with anyone who wants to participate. Come make a Magazine with us! Inspired by the the neighbors surrounding Stoneview Nature Center! The artists of FALLEN FRUIT, David Burns and Austin Young, invite you to a 3 hour collaboration with anyone who wants to participate. Come make a Magazine with us inspired by your neighborhood! Share your photos and stories- these will become a collaborative zine, available as a free downloadable pdf and also onsite at Stoneview Nature Center. The event will take place at Stoneview Nature Center. It’s free and open to the public of all ages –– we can’t wait to see you there! 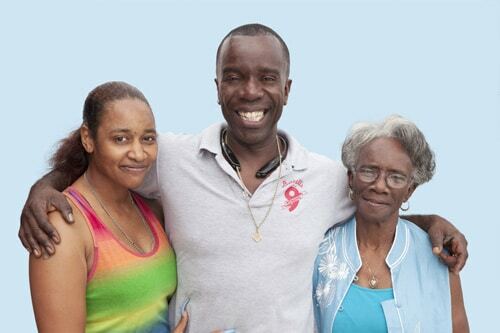 Bring family photos from Baldwin Hills neighborhood. Bring your kitchen utensils- large or small- to add to the public chandelier. 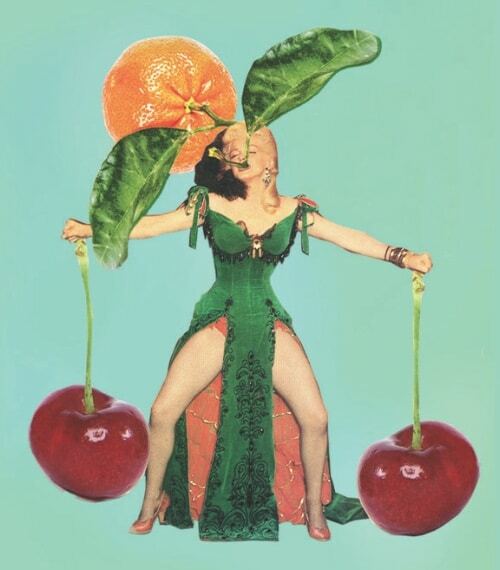 Fallen Fruit Magazine brings together public participation, local histories and story-telling. 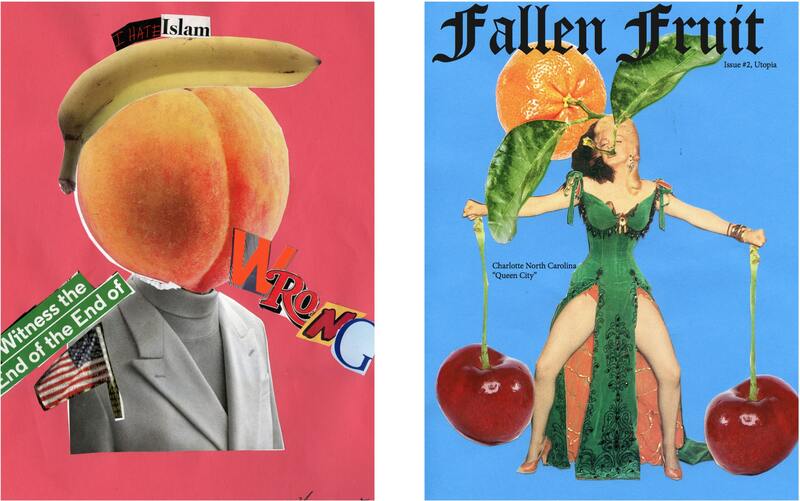 Using strategies of collage this temporary team collaborators use fruit as a symbol, object and/or subject to create original editorial content to produce in a one-day a site-specific limited edition contemporary culture magazine. This edition is unique and is editorially focused on histories the neighborhood and community. Bring meaningful family photos from the neighborhood. portraits of elders in the community and historical events. We’ll create cut-out collage, hand-made graphics, illustrations for short written text, original artwork, current event commentary all through a lens of fruit, love and contemporary culture. The final document becomes an electronic PDF available for download. 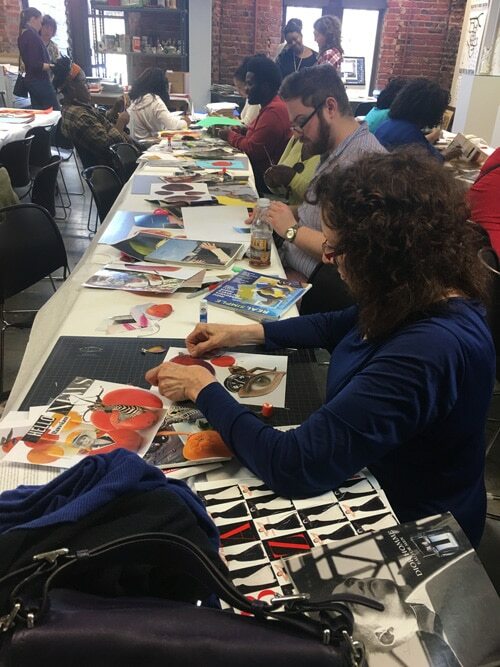 In addition to providing the materials for their public participatory project, Fallen Fruit Magazine, which included cutouts of various fruit and fashion magazines, the artists ask participants while they work to think of and include their own stories. Help our Kickstarter so we can plant 300 fruit trees in New Orleans. We are bringing our Creative Capital project to New Orleans! 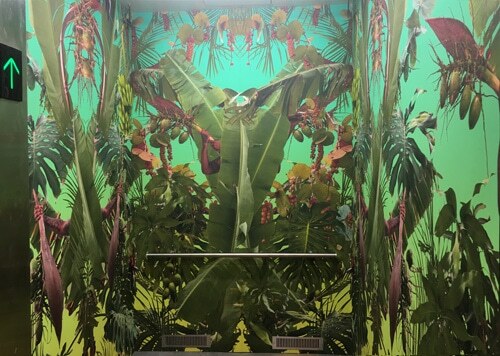 Pelican Bomb, A Studio in the Woods, and Newcomb Art Museum of Tulane University present “Fallen Fruit of New Orleans,” a citywide suite of public projects with internationally acclaimed artists Fallen Fruit (David Burns and Austin Young). This multi-site presentation continues Fallen Fruit’s exploration of the ways people experience public space. As one component, Fallen Fruit will plant 300 fruit trees throughout New Orleans in 2018—in honor of the city’s tricentennial—for residents to share, and you can help by supporting our Kickstarter campaign until November 21. The Kickstarter helps us meet our goal of providing matching funds to a grant from the National Endowment for the Arts. If you are interested in taking part in this, but don’t live in New Orleans then you might want to get yourself a hotel (such as the InterContinental New Orleans hotel), as this way you have a place to stay and can join in with planting 300 fruit trees. Fallen Fruit started in 2004 in Los Angeles with the creative mapping of locations of fruit growing on or over public property, and since then the artists have worked in over 30 cities around the world. In January, they will work in partnership with the Lower 9th Ward Center for Sustainable Engagement and Development and the City of New Orleans Department of Parks and Parkways to plant networks of publicly accessible fruit trees in two New Orleans neighborhoods: along the Bayou Bienvenue Wetland Triangle in the Lower 9th Ward and in Pontchartrain Park. Residents and community groups in both neighborhoods can also participate by planting trees along sidewalks in front of their homes, churches, and businesses to provide a much needed resource—fresh, healthy food—to their friends, neighbors, and anybody passing by. And the artists will host a citywide tree adoption day, open to all, at Newcomb Art Museum on Tulane University’s campus. All of the planted fruit trees will join Fallen Fruit’s Endless Orchard, a massive, living public art and digital mapping project. Fallen Fruit is an art collaboration originally conceived by David Burns, Matias Viegener, and Austin Young. Since 2013, Burns and Young have continued the collaborative work. “Fallen Fruit of New Orleans” was initiated by Pelican Bomb in 2015. In 2005, when Hurricane Katrina hit and the federal levees failed, flooding and wind destroyed the tree canopy along the Bayou Bienvenue Wetland Triangle. Further ecological shifts, including salt-water intrusion, have also led to tree loss in the area, and residents of the Lower 9th Ward have verified that most of the neighborhood fruit trees have been destroyed. Fruit is a symbol of generosity across cultures. In Fallen Fruit’s work, fruit offers a platform for sharing, storytelling, and collective understanding. Studies have shown that fruit trees have further positive impacts: catching rainwater and removing pollutants from the soil and air; supporting the ecosystem of bees, birds, and wildlife; promoting well-being and food security; increasing property values; and creating more beautiful and walkable streets. Researchers have even linked an increased tree canopy to decreased crime rates. To help plant fruit trees across New Orleans, donate to Fallen Fruit’s Kickstarter campaign before it ends on Tuesday, November 21. We have four weeks to meet our fundraising goal of $20,000, and we can’t do it without you. For Kickstarter rewards, the artists have designed a selection of exclusive items ranging from tote bags and fruit jam to limited-edition prints and experiences, including the opportunity to dedicate a fruit tree in your name or in honor of a loved one. Alongside the planting of 300 fruit trees in New Orleans, Fallen Fruit will work with local residents to create fun and enriching public participatory programs that celebrate New Orleans’ social histories, neighborhood stories, and the value of generosity and collective action. 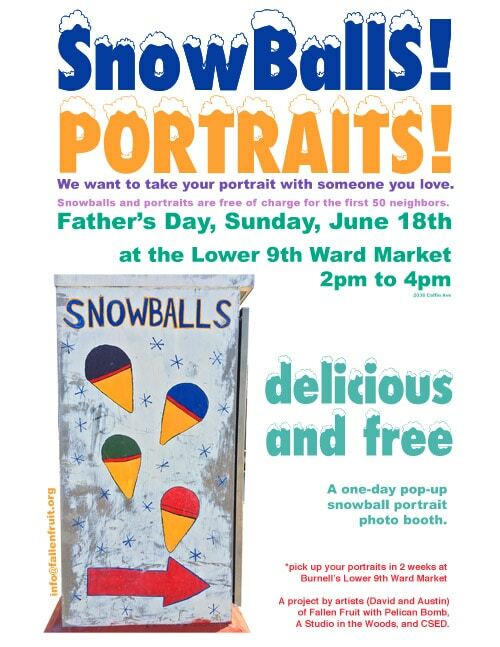 These include a pickle party where residents gather to make delicious pickles; a collectively made magazine; a sno-ball portrait studio; and more. And in April, Fallen Fruit will open an exhibition at Newcomb Art Museum bringing together objects from Tulane University’s special collections to further examine the ways the story of New Orleans is told. Recent exhibitions and projects include commissioned works by the Los Angeles County Museum of Art; the Queensland Art Gallery & Gallery of Modern Art, Brisbane; the Athens Biennale; the Bemis Center for Contemporary Art, Omaha; the Portland Art Museum; and the Wexner Center for the Arts, Columbus. 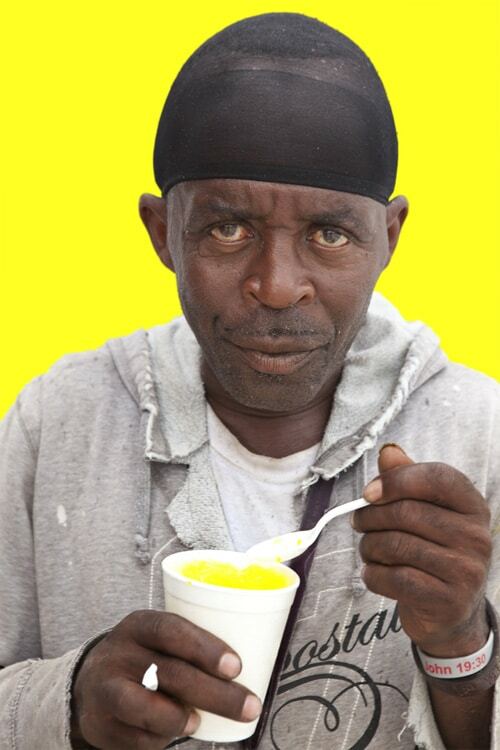 Imagine a New Orleans where everyone can walk out of their front doors to enjoy freshly picked pieces of fruit. 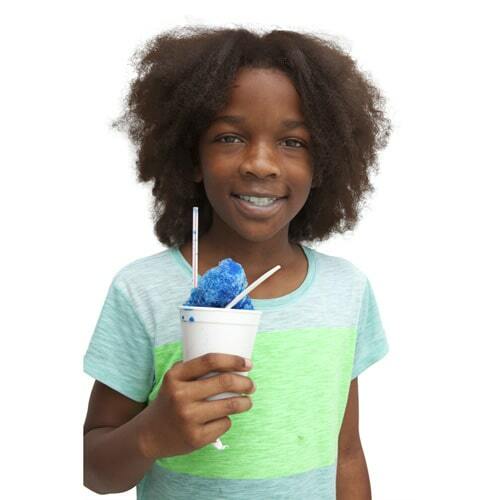 Donate now on Kickstarter to support “Fallen Fruit of New Orleans” before Tuesday, November 21. *The Endless Orchard is a Creative Capital awarded artwork and phase one was funded by the Muriel Pollia Foundation, Good Works Foundation, the Awesome Foundation and everyone who supported our ‘phase one’ Kickstarter. Check out the web app at EndlessOrchard.com and add to this massive edible collaborative fruit sharing map. 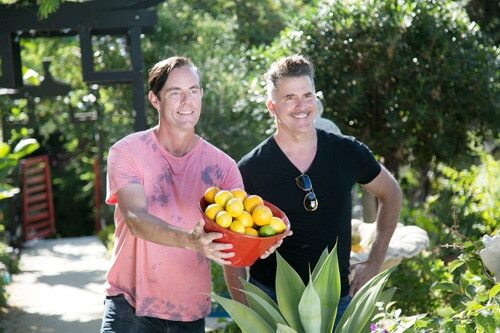 Watch us, Fallen Fruit’s David Burns and Austin Young, this weekend on Naturally Danny Seo! What the world needs now is love sweet love…. and fruit. 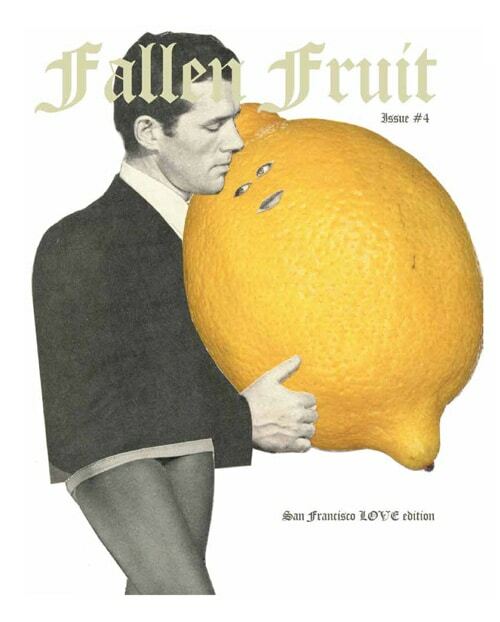 Fallen Fruit Magazine, The “Love” Edition is a zine made by Fallen Fruit (David Allen Burns and Austin Young) It was a 3 hour collaboration on Natoma Street, San Francisco, California, on July 29, 2017, 3-6pm with Sites Unseen and everyone who participated. Sites Unseen is working with local community partners and cultural institutions to bring dynamic arts program- ming to seven underused alleys in the neighborhood in the form of permanent and temporary artworks, per- formances, screenings, and other happenings. e alleys––Annie, Clementina, Jessie East, Lapu Lapu, Minna, Natoma, and Shipley Streets––will provide a platform for both local and national artists at all career stages to showcase work within a uni ed curatorial framework. Sites Unseen will activate these neglected areas by foster- ing social interaction, community pride, and economic opportunities while increasing visitors’ exposure to the arts. 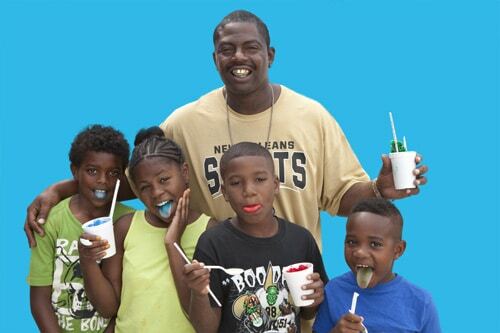 We wanted to meet neighbors and celebrate summer in the Lower 9th Ward. Fallen Fruit in New Orleans! Fallen Fruit has partnered with Pelican Bomb, A Studio in the Woods, Lower Ninth Ward Center for Sustainable Engagement and Development, and Newcomb Art Museum! We got the NEA PROJECT GRANT FOR 2017 to plant two Public Fruit Parks in New Orlean. Come help us plant in January 2018. We will present our exhibition celebrating the collection of Tulane University and the Newcomb Art Museum at the Newcomb Art Museum in April 2018. Stay tuned for more information about our initiative working with local residents to plant publicly accessible fruit trees and record the city’s rich histories. A 3 hour collaboration with anyone who wants to participate. Come make a Magazine with us! Inspired by the Summer of Love with Sites Unseen! 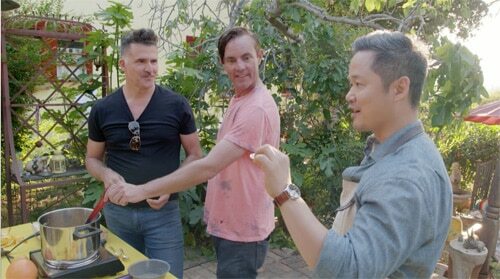 FALLEN FRUIT, David Burns and Austin Young, invite you to a 3 hour collaboration with anyone who wants to participate. Come make a Magazine with us inspired by the Summer of Love! “We are inspired by LOVE, Utopia, and idealism. 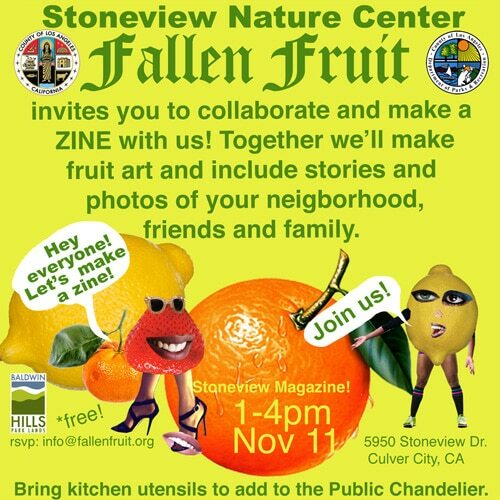 People are thinking about what could make the world a better place, and feeling empowered.” – Fallen Fruit will also have a kissing booth and take portraits of people kissing at the site to include in the zine. The event will take place on the block of Natoma St between New Montgomery and the back entrance to SFMOMA. It’s free and open to the public of all ages –– we can’t wait to see you there! The event will launch artist Leah Rosenberg’s new seating and lighting installation in Natoma Street in downtown SF, featuring a participatory #CrochetJam with Ramekon Oarwisters. 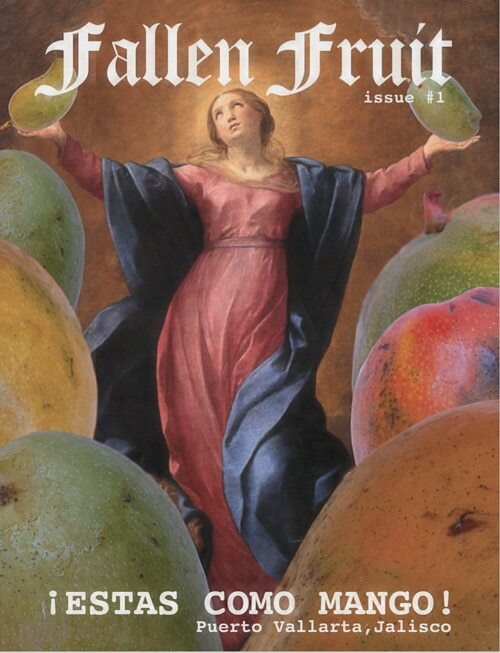 Fallen Fruit Magazine brings together public participation, local histories and story-telling. 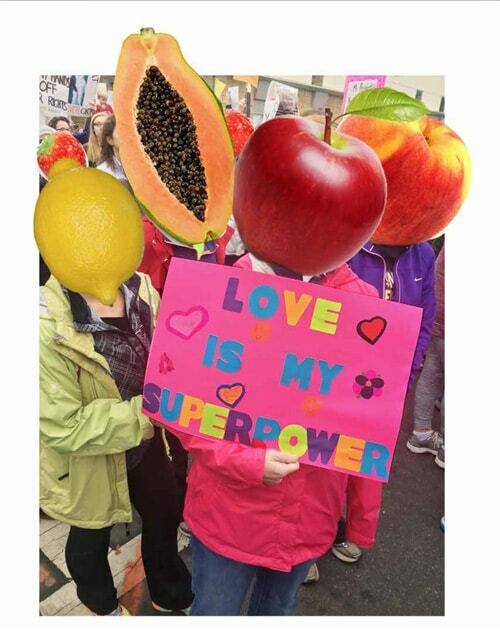 Using strategies of collage this temporary team of culture advocates use fruit as a symbol, object and/or subject to create original editorial content to produce in a one-day a site-specific limited edition contemporary culture magazine. Each edition is unique and is editorially focused to topics and subject matter that is historically meaningful to the neighborhood and/or region. We’ll create cut-out collage, hand-made graphics, illustrations for short written text, original artwork, current event commentary all through a lens of fruit, love and contemporary culture. The final document becomes an electronic PDF available for download. 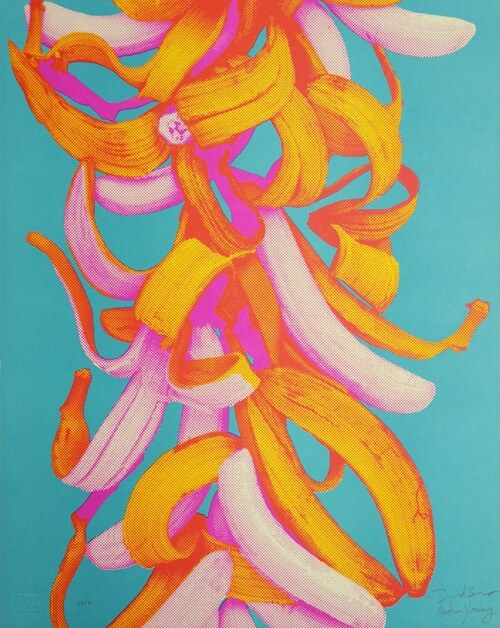 Bananas in 3 Colors – print for sale! *All proceeds from the print will benefit Fallen Fruit, the Endless Orchard, and planting fruit trees in public space for everyone to share. 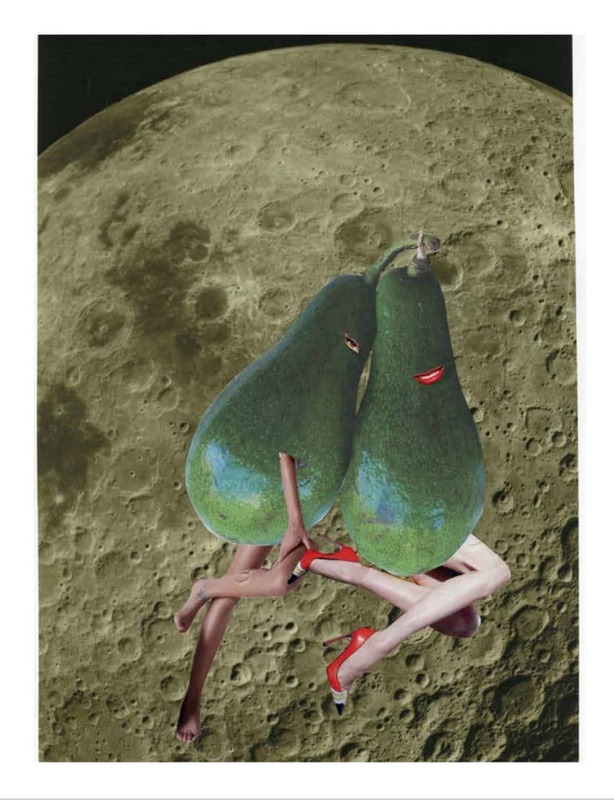 or Email Fallen Fruit if you’d like to purchase the print with a tax deductible donation. Fallen Fruit (David Burns and Austin Young) has created a unique print in collaboration with Bert Green Fine Art in Chicago, and Aardvark Letterpress in Los Angeles. 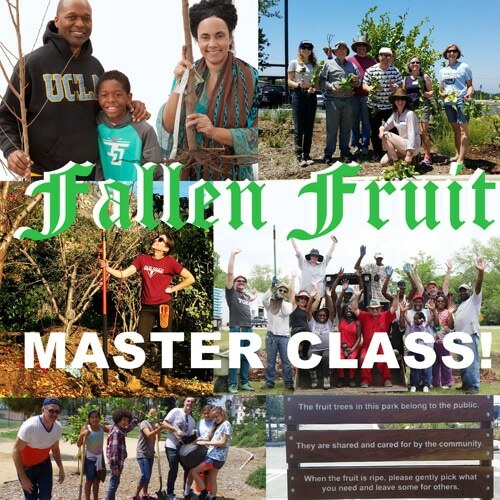 Fallen Fruit work with fruit as a medium to involve the public, create communities and initiate narrative by engaging through workshops and individual works of art. This print is made using fluorescent ink, and changes radically when viewed under a black light. 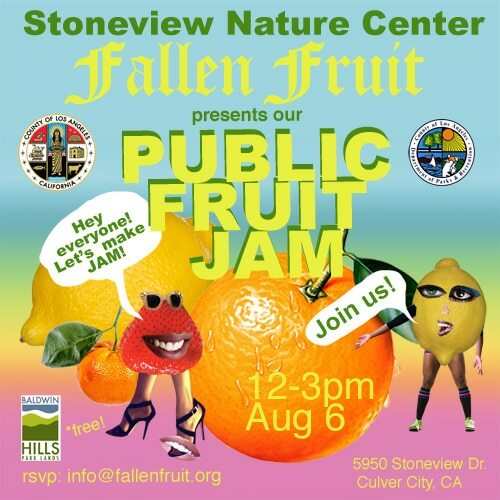 Join Fallen Fruit at Stoneview Nature Center for a Public Fruit Jam! 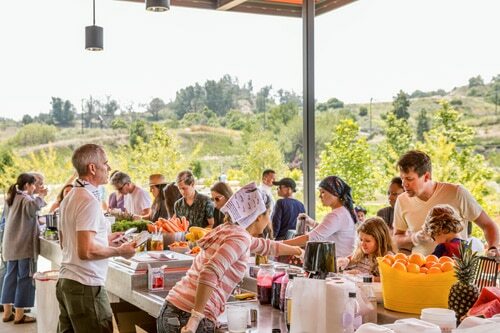 An interactive collaborative exploration of fruit, community, and neighborhood goodness. Join us and your friends and neighbors to make jam together. We’ll have plenty of fruit– or bring your home-grown or street-picked fruit, and come jam with us! Wash your fruit prior to arrival. Bring bring a friend or neighbor too! Working without recipes, we ask people to sit with others they do not already know and negotiate what kind of jam to make: if I have lemons and you have figs, we’d make lemon fig jam (with lavender). 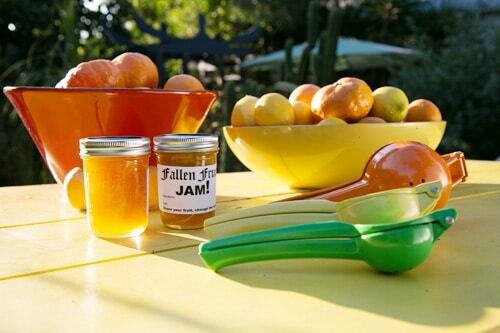 The Public Fruit Jam harkens back to old-time community harvest festivals. The kinds of jam we make will improvise on the fruit that are available. 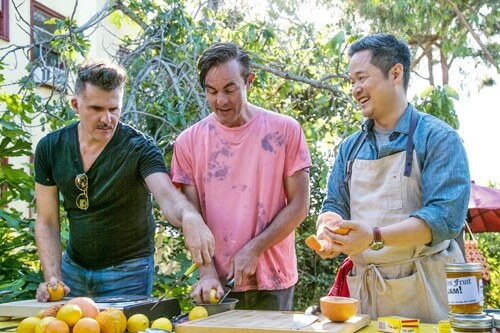 The artists of Fallen Fruit will bring public fruit picked from the streets of Los Angeles. We are looking for radical and experimental jams as well, like strawberry grapefruit or lemon pepper-and-lavender jelly. You’ll learn about the basics of jam and jelly making, pectin and bindings, as well as the communal power of shared fruit and the magic of public fruit. Stoneview Family Photos– Neighbor’s of Stoneview Nature Center: The artists need your help to complete the artwork for the park. They are looking for family photographs from the neighborhood from the 1950’s to present. Photos will go into the community building or exist in an online archive of the Blair Hills neighborhood. Public Chandeliers– Chandeliers are being created from spoons, and forks and butter knives, kitchen utensils, etc from family homes in the area. Bring stray utensils to be a part of the project! 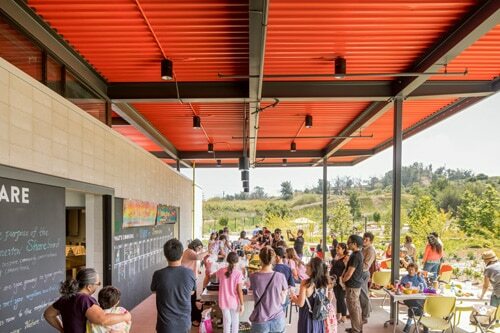 “The 5-acre Stoneview Nature Center two miles west of Stocker — and itself a stop on the Park-To-Playa Trail — sees Fallen Fruit’s integral design elements in a more conceptual but still absolutely edible landscape integrated into the new construction’s progressive municipal design/build award. Co-proposed with Ehrlich Yanai Rhee Chaney Architects, AHBE Landscape Design, and graphics by Omnivore, the site is a sustainable, multi-use vision for a community center featuring outdoor kitchen and gathering areas, art installations based on the neighborhood’s history, and at its heart, Fallen Fruit’s organic rainbow of living colors, rich symbolism, and narrative in the form of free harvests of pomegranates, lemons, oranges, avocados, grapes, berries and figs. “ – Shana Nys Dambrot, Huffington Post. 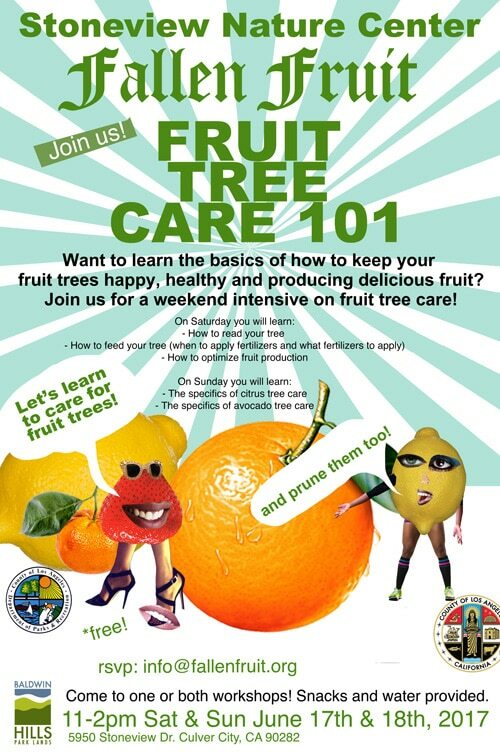 Want to learn the basics of how to keep your fruit trees happy, healthy and producing delicious fruit? 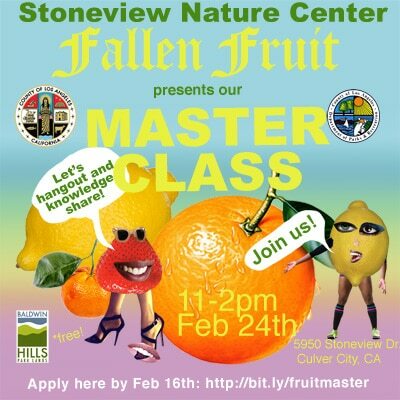 Join us for a weekend intensive on fruit tree care at Stoneview Nature Center from 11:00 – 2:00(?) on Saturday and Sunday June 17 & 18. Come to one or both workshops! Sweet & Sour!! June 4th! Fallen Fruit present our Fermentation Station at Stoneview Nature Center! Fallen Fruit Sodas — With your help, we will be creating custom flavored fruit syrup to make fermented sodas. These are all natural, low sugar and totally delicious. Everyone can participate, big kids, little kids, moms, dads, grandparents, neighbors, friends and more. Flavors will include raspberry, meyerlemon with basil, watermelon and more combinations we get to create together! Everyone will get at least one bottle of soda to take home. Fruit Pickles!! — We all love pickles — Summertime crunchy, yummy cucumber pickles. Cukes are a fruit!! But we can pickle more than that. Okra (is a a fruit!). Apples, Zucchini, Watermelon rinds, and more. Use your imagination and build your own pickle jar. We will make the brine and you will have delicious pickles to share with your family in friends within 1-2 days! They will keep in the fridge all summer and these pickles made perfectly, with love. 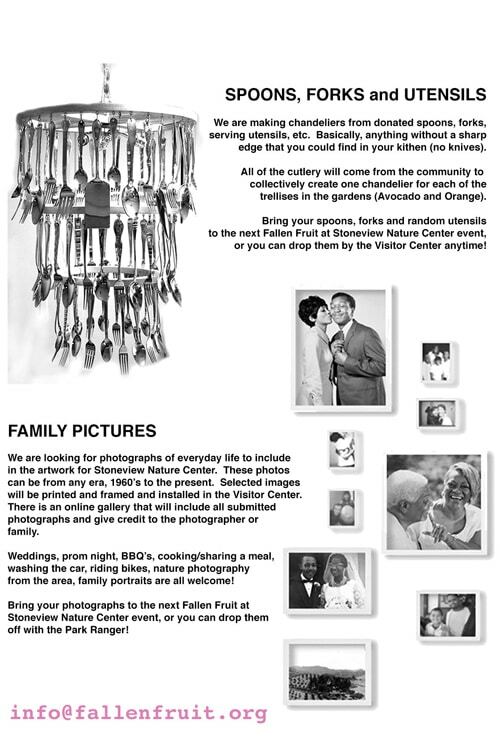 Stoneview Family Photos- Neighbor’s of Stoneview Nature Center: The artists need your help to complete the artwork for the park. They are looking for family photographs from the neighborhood from the 1950’s to present. info@fallenfruit.org Photos will go into the community building or exist in an online archive of the Blair Hills neighborhood. Public Chandeliers- Chandeliers are being created from spoons, and forks and butter knives, kitchen utensils, etc from family homes in the area. Bring stray utensils to be a part of the project! In addition to providing the materials for their public participatory project, Fallen Fruit Magazine, which included cutouts of various fruit and fashion magazines, the artists asked participants while they worked to think about the theme of “Utopia” and current events, such as the Women’s March on the day after the 2017 presidential inauguration.